It’s dark and cold outside, and light is fading by mid-afternoon. Time to retreat into the bedroom, where, with a little ingenuity, you can cosy up and cuddle down. Even in a shared flat, this is your own domestic cocoon. Thread count on the label charts the density of fibres per square inch. Just remember 200 is workaday, 400 is good quality, and 700 upward seduces into luxury. M&S now has a choice of 10 fibres/ blends for linens. Top of the range is Supima satin, the world’s finest cotton with 750 threads — duvet covers from £85-£145. Pure linen has 400 threads. Duvet covers £59-£99. John Lewis bedding department has an impressive bar of 24 “feel-me” samples for duvet fillings, and racks of different pillows to try. A new brand of cotton called Genuisa has a 1,000 thread count that feels like silk. Winter whites, creams, taupe and soft greys are soothing and serene. Classic white bed linen is the linchpin, enhanced perhaps with touches of metallic threads. Dark colours are dramatic yet forgiving. Download the Dulux Visualiser app to your phone or tablet, and experiment on screen. We are spoilt for choice in the linen departments of our big London stores. Harrods homeware department is stunning, Liberty is famous for its prints and John Lewis endlessly helpful. Keep the patterns low-key and peaceful. 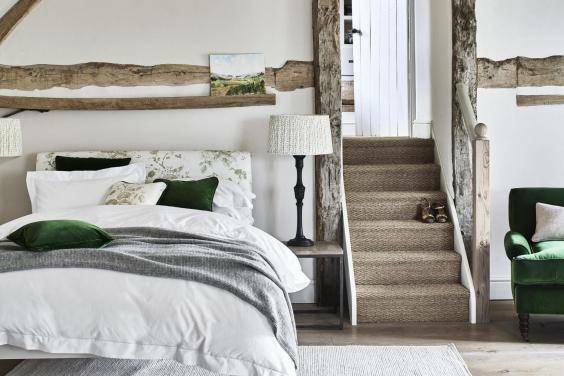 Put a large natural fibre blanket at your feet to pull up for extra cosiness, and spread a big creamy-white sheepskin rug on the floor to sink your feet into. Fashionable velvet is soft and sensuous. Once Milano, a small firm run by two Italian women in the UK, specialises in fabulous Italian linen. Its velvet blanket in gold or burgundy (135cm x 200cm) backed with 100 per cent linen is £408 (once.milano.com). Wherever you find yourself, spread out a soft wool throw, they are just about the cosiest thing you can snuggle up in. Choose gentle heathery shades or plaids. Wool is billed as the perfect bedtime fibre, adjusting naturally to body temperature. 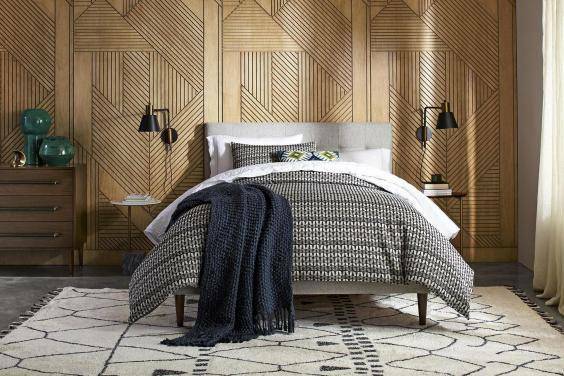 Immerse yourself in The Woolroom’s wool-filled duvets, wool mattresses and even a wool bed. 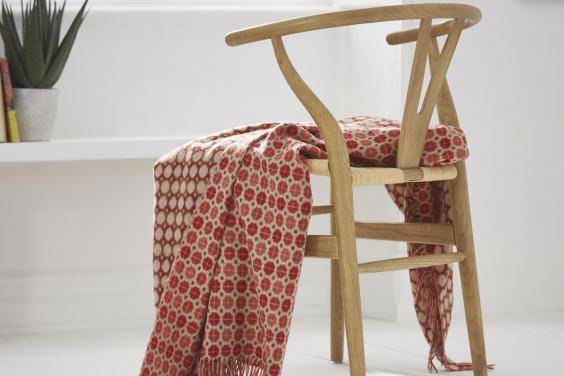 Its lovely throws are currently reduced to a bargain £44.99 (thewoolroom.com). Buy well-made lined curtains to keep out cold and noise — John Lewis can make them in seven days. Its experts will work out fabrics, headings, tracks/poles and so on. It’s a popular service so try to shop off-peak. Ready-mades are even quicker and most shops stock them. Measure up carefully and take a snap of your window with you to the store. Luxe website Amara has a selection for immediate delivery (amara.com). Headboards are back big-time and will cushion you for surfing the net, checking emails/texts/social media, watching catch-up TV, or chatting on the phone. The Headboard Workshop with their own craftsmen in Wales, are experts. Chat to director Euan Kelway-Bamber on 01291 628 216 (theheadboardworkshop.co.uk). Headboards come with struts (theirs are adjustable) which marry up with standard fixings on the bed. Larger models rest on the floor, but cleverly don’t take up extra space. They deliver and fix, and orders, custom-made, take about a month. 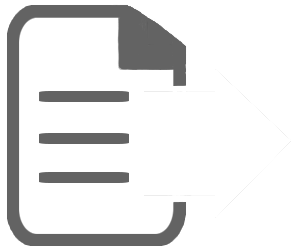 Or try justheadboards.co.uk, who can deliver some ready-mades within a week. Well-made lined curtains keep out cold and noise – John Lewis can make them in seven days, and an expert will work out fabrics, headings, tracks/poles and so on. It’s a popular service so try and shop off-peak. Ready-mades are even quicker, with basics in all stores. Measure up carefully, and snap your window, before you go shopping. Montgomery’s (established 1952) are on-line leaders for speedy ready-mades (Montgomery.co.uk; 0330 660 0817; also at Roomes of Upminster, and Elys of Wimbledon). Luxury website Amara have a select choice on-line for immediate delivery. Dim your overhead light right down, or better still just use table lamps, maybe with touch dimmers – but check you and your partner have stable angled lights for reading which won’t disturb each other. Ikea sell bulbs with a remote control for £15. More sophisticated systems are controlled by your phone. You can preset times to come on and off, with gentle “fade-ins” and changing colours.